Here are maps to help you locate and explore Wirksworth and the towns, villages and hamlets within the Wirksworth Area (approx. the same as the old Wirksworth Parish). Many thanks to Multimap.com for providing the maps. Surrounding counties are Yorkshire, Nottinghamshire, Leicestershire, Worcestershire, Staffordshire and Cheshire. Capital city is Derby. Major places are Chesterfield, Long Eaton, Ilkeston, Buxton, Glossop, Matlock. Ripley, Alfreton, Bolsover and Dronfield. 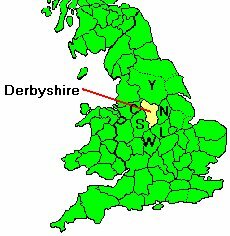 Derbyshire contains 327 parishes. Wirksworth parish is in the centre of Derbyshire. Surrounding parishes in 1800 were Cromford, Crich, Heage, Belper, Hazelwood, Duffield, Turnditch, Hulland Ward, Hulland, Kirk Ireton, Hognaston, Carsington, Brassington, Aldwark, Winster and Bonsall.